Pretentious people with masks are all around us. Can we not see them? Or do we choose not to? Lately there are so many people masking themselves, pretending to be who they are not. Did you hear about the lady in Algeria who was sued by her husband because she wasn’t who she pretended to be? The husband thought he had married a beautiful, gorgeous woman but once those inches of foundation and make-up came off, he got a fright looking at what was left of her. If you remember, there was also a case of a man in China who sued his wife for failing to disclose that she had undergone a series of plastic surgeries prior to marriage. He claimed to have fathered three ‘ugly’ children due to his wife’s ‘cheating’ . Everywhere around the world there are cases of pretentious people deceiving others. We have them in our home, in our workplace, our community and even on Facebook. I wonder what makes people transform themselves into what they are not. Could it be the lack of confidence? Perhaps painting our faces and filtering our selfies before posting them on Facebook and Instagram helps regain our self-esteem. Maybe. While I can somehow understand the need to do whatever it takes to boost one’s self-confidence by improving one’s looks, one should also pay equal if not more attention to improving the inner-self. But funny though, improving one’s personal character and ethics seem to be the part of self-improvement we stay away from. Then again, people don’t only wear masks to look pretty. Masks can come in many different forms. There are some who wear masks to look noble. 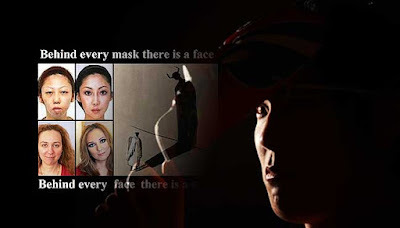 Some wear masks to deceive others into believing they are who they are not – the mask we wear to gain trust; the mask we wear when we make promises; the mask we wear to portray nobleness; the mask we wear when we claim innocence; the mask we wear when we say ‘I love you’. We are surrounded by masked men all the time. These pretentious people deceive us every day. Every smile we see, every greeting we hear, every embrace we get, every promise, every cheer, every encouragement, every fight. Look around you. Who do you think are wearing masks? Who aren’t? Do you think your partner truly loves you? Do you think your relatives truly care for you? Do you think your neighbours are genuinely kind? Do you think your staff are really hardworking? Do you think your leader is trustworthy? Do you think the lady in yellow is fighting for a good cause? Think. Let us not be fools. Are we so easily deceived because they are so good at it? Or is it because we are so naive? Or do we choose to ignore the mask because well …“ better the devil we know…”. Look around you, who are wearing masks and who are not. Look at yourself. Are you wearing a mask?